I have never been ahead of trends. I always hear about good television shows when they’re well into their second or third seasons; I mainly buy clothes when they’re on the clearance rack, meaning that they’re already out of style; I did not start eating kale, quinoa, or polenta until they showed up a Trader Joe’s and were, therefore, passé in the eyes of real foodies. I can’t exactly remember when or how I learned that she was publishing a novel, but I distinctly remember buying it shortly after the book’s publication in 2001: standing in the Plymouth Meeting Barnes & Noble, trying to shield the cover from my then-boyfriend’s eyes, because it was pink and bore the title Good in Bed. I was a Serious History Major, and he was a Serious English Major, and I didn’t want him to know that I was so excited to read something that was clearly not a Serious Book. But I went home and devoured Good in Bed, and have read it again and again and again in the years since. It’s one of my favorite books—sharp and funny and sad in places, with a heroine who, I imagined, would have been my friend in real life. 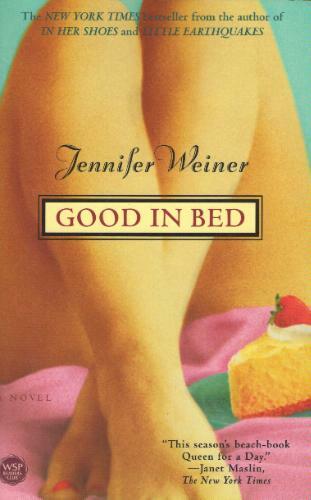 Good in Bed went on to become a bestseller, and then Weiner wrote another excellent book (In Her Shoes) that became a movie featuring Cameron Diaz and Shirley MacLaine, and more bestsellers followed. Weiner started tweeting about feminism and her drive for getting respect for “chick lit” from the literary establishment—and also live-tweeting The Bachelor—and now The New Yorker has profiled her, and I am far from her only fan. I’ve read every one of Weiner’s books and enjoyed the majority of them; some resonate with me more than others, but they’re all enjoyable and well-written—as the Inquirer says, “Weiner is a far better writer than she’s given credit for.” Most of the time, reviewers write about how her characters learn to accept their physical differences (obesity, disfiguring scars, etc.) in a world that prizes beauty and perfection. But what I’ve learned from reading Weiner’s books, and hiding it for many years, is to be honest. Be honest about the fact that I often enjoy women’s commercial fiction as much—or more than—Serious Literary Classics. That when I sit down on a flight to Shanghai, I’m most likely to pick Clueless or Pitch Perfect from the movie menu for the umpteenth time to entertain me. That my Feedly reader features Go Fug Yourself and Suri’s Burn Book alongside China Real Time and Inside Higher Ed. Weiner, who holds a degree in English from Princeton*, writes characters who are likely to toss off an Edith Wharton reference in one breath and invoke Say Yes to the Dress in the next—and that’s pretty much how I’d describe myself, too (though I prefer Property Brothers). Exactly. I’m pretty sure Jennifer Weiner would agree. 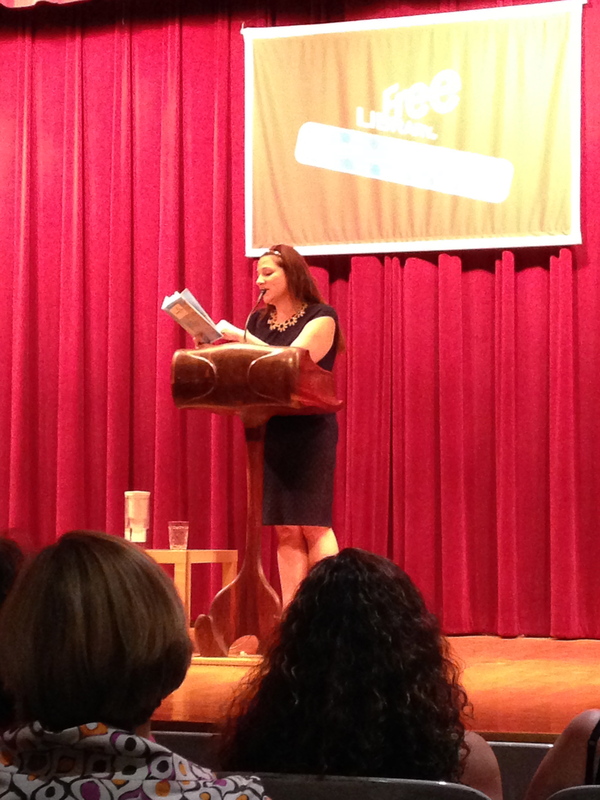 As would, I think, the two hundred or so other women who filed into the Free Library of Philadelphia’s auditorium with me last night to hear Weiner speak about her new book, All Fall Down (which I haven’t read yet; I’m saving it for Shanghai jet lag when I fly back at the end of the month). We were all clutching napkins filled with cannoli and brownies—Weiner always hands out baked goods at her book talks, which increases the feeling that she’s a good friend chatting with you over calorie-filled desserts and a bottle of wine (which, unfortunately, wasn’t being served). Weiner told dirty jokes and embarrassing stories about her daughters, but also turned serious when she explained that it was her father’s death that led her to write a novel about addiction. Her speech was peppered with “likes” (a habit that I’m told I share as well) and she played with her hair a lot, generally exuding an air of being very smart but also not someone who takes herself too seriously. I’ll never call Jennifer Weiner’s books “guilty pleasures” or argue that I have to eat my broccoli (Jane Austen, Charles Dickens), before I can indulge in a cannoli for dessert (Weiner, Emily Giffin [though I think her work is much more uneven]). It’s not a trade-off, and one type of book isn’t better than the other. I read what I like and I’ve learned not to hide or apologize for my choices. Jennifer Weiner taught me that. * In a funny coincidence, I just realized that she was studying in the English department at Princeton at almost the exact same time as one of my other favorite writers, Peter Hessler.